Browse: Home / wowned – Authentication bypass for outdated WoW emulation authentication servers. wowned application is a proof of concept exploit for the authentication bypass methods in many World of Warcraft emulation authentication servers. It is a common practice among security researched to release a proof of concept exploit after vendors and users have had ample opportunity to apply a patch. Doing so can encourage the remaining vendors or users to follow suit. To use, auth_bypass.dll must be injected into wow.exe (versions 1.12.1, 2.4.3 and 3.3.5a are supported). An injector wowned.exe is included. 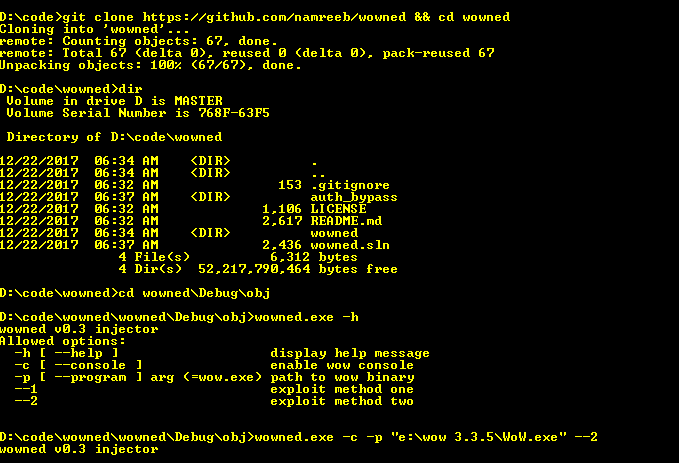 ← Trojanizer : Trojanize your payload – WinRAR (SFX) automatization.